Kraus-Anderson headquarters is on the move. This month approximately 120 downtown Minneapolis KA employees are pulling up stakes and moving to 3433 Broadway Street NE, our new temporary office location for the next 18 months as KA prepares to break ground on our site for a new headquarters on the corner of Fifth Avenue and Eighth St. S. The existing 525 S. Eighth St. building, built in 1975; and 523 addition, ca. 1978, are slated for demolition in the coming weeks. But the memories will remain. Q: When did you first start working in the 525/523 building? What was your role? BRUCE ENGLESMA, KA COMPANIES: I started in 1975. After graduating from being the “can man” (cleaning the toilets) at MMOB (the Metropolitan Medical Office Building was owned and operated by KA and is now Parkside Professional Center), I started as coordinator for finishing the opening, and operating Village North Bowl. My work area was where the admin copier is now. MARY JO KELLY, KA MORTGAGE: 1976, as secretary and bookkeeper. 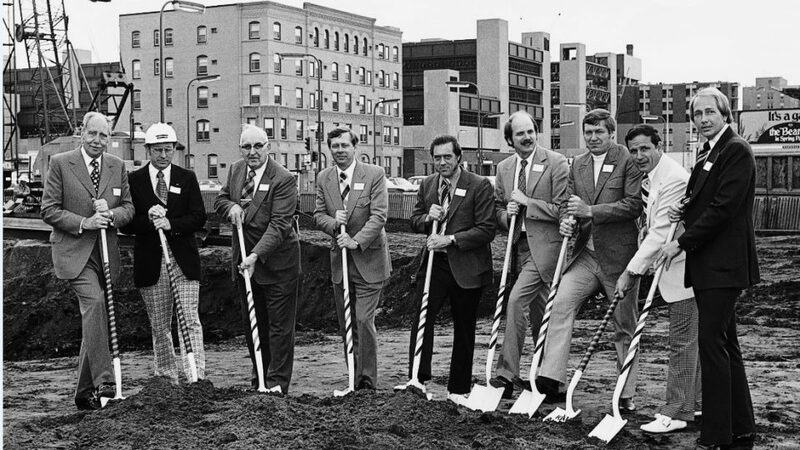 I was one of the first two employees of Kraus-Anderson Mortgage Co.
BILL JARVIS, KA CONSTRUCTION: 1979. I was project cost control manager. Second floor in what was then the accounting area. We were in a bull pen, with hard walls going halfway up. AL GERHARDT, KA CONSTRUCTION: March 20, 1980, starting as an estimator/assistant PM. I was living in Cedar Squares West and riding my bike to work. DAN ENGELSMA, KA REALTY: I first started in the 501 South Eighth St. building. There were only three real estate people in the 501 building. 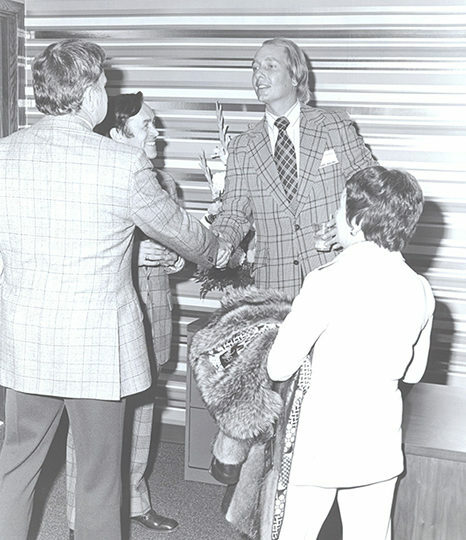 Dan Engelsma, Burt Dahlberg, and Gordy Fox. In 1976 I moved to 525 Building, and in 1978 the 523 Building was constructed and Realty was moved into the two floors at that location. Then in 1994 we moved Realty to Bloomington. ROSANN (ROSY) HEBERT, KA MORTGAGE: 1975. I moved from the 501 building when 525 was ready for occupancy. I was accounts receivable, invoicing project owners. JAN GOEBEL, KA HISTORIAN: I first worked in the building in December 1976, as assistant to Lloyd Engelsma. But I partied there before I worked there. MARYANNE LONDON, KA COMPANIES: 1975. I was hired as PR director for KA Advertising. I started the KA newsletter by pre-printing layout sheets and typing the copy in to fit the format. LEANN CARSTENS, KA CONSTRUCTION: 1991. Project secretary–east end, desk with the pillar next to the “Blueline” room. I sat there for 13 years – A Mac with large screen and floppy disks was there when I walked in the door. Never used a Mac, had just started using a Compaq computer; typing contracts on a typewriter and keeping handwritten logs on everything; making actual bluelines. Q: What personages do you remember from those days, and why? GERHARDT: Jerry Svee, EVP and Dan Walgenbach, chief estimator (who hired me). I was doing manual take-off/estimating of preliminary designs for large hotel projects for them. At the time they seemed to have a strong grasp of project costs, but scared me to death how loose they were with providing price opinions on projects. Of course, Lloyd was always looked up to and respected. He didn’t say a lot, but gave clear direction and showed great appreciation. GOEBEL: I worked with Lloyd Engelsma, Burt Dahlberg, Ken Johnson, Rachel Toftely, Burt’s secretary. Later we were joined by Mary Jo Dickenson (Kelly) who was Ken Johnson’s secretary. To the south of us was Steve Duncan and the rest of his KA Advertising crew. LONDON: Mike Richards had the insurance agency in the corner. Barb Sedges was in the office doing his books. Bruce, six months after I got there, sat at an open desk in the same area. There were just a few of us. I had an office. My boss, Steve Duncan, was the first director of the agency. Lloyd put it together so that we could keep the commissions from the advertising that we placed for the shopping centers. Early on, I began doing the shopping center event marketing; and was instrumental in the shopping centers opening in the 70’s: Iron Mountain, Plaza 94, LaCrosse. My first client was Valley West, and I am still doing the marketing there. We eventually oversaw the marketing for 12 shopping centers. CARSTENS: Lloyd, Marci Lindberg, Jan, Sharon Layeux my boss; Ken Augst, what a joy—“a lamb in bears clothing.” Most PM’s were “babies,” just dating, no families and most had hair– Mark Coudron, Dave Rollins, John Solberg, Al Gerhardt, Tom Sackett my good friend to this day; Bill Jaeger-his energy, generosity and empathy for everyone, Jerry Dreis and the accounting group, Jon Sarff, legal beagle with a dry dry sense of humor. KELLY: It’s been a pleasure to work with Bruce and Dan all these years. I feel like we grew up together. I also remember the KA Realty folks who were always so much fun. Q: What do you remember about those days? What were some of the modern (at the time) building features? GOEBEL: The wallpaper was GREAT. The murals in some areas were lovely. The furniture was upholstered in bold earth colors. JARVIS: Full wall, wall paper murals of forest scenes. The outdoor patio off the basement. 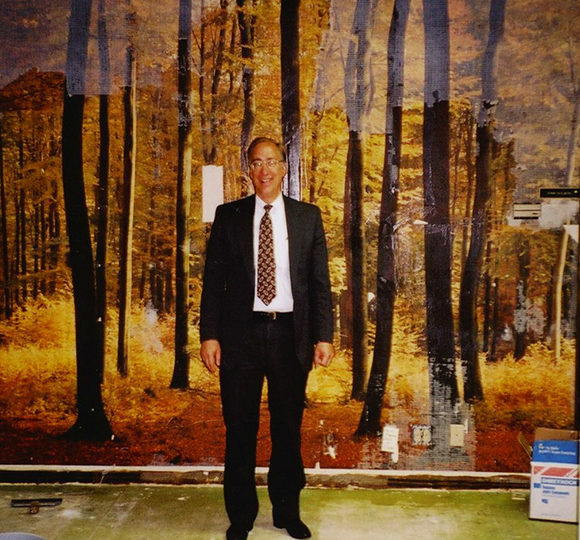 The 1970’s mural wallpaper was uncovered during remodeling in 1987. KELLY: I had worked at an insurance office before coming here and I remember thinking KA had a really fancy lobby and state of the art electric typewriters which I didn’t know how to use at my job interview. I actually really like this building, it has a mid-century modern feel and thought it always had curb appeal. BRUCE ENGELSMA: Well, we had a copier. And a big room in the basement full of a computer. GERHARDT: We only had a couple computers in the office which had to be dialed into in order to communicate with. We thought we were a pretty big deal with those. Adding machines and memory typewriters were the high tech tools of the day. Later we bought some “Work Processers” which were located in separate rooms and shared by several of our staff. Almost everybody in the office had an ashtray on their desk and smokers, smoked pretty much wherever they were in the building. GOEBEL: We were so busy expanding the business and having fun. CARSTENS: How much fun we had with realty, accounting & payroll, construction and the other entities all together in the building. Felt like family. BRUCE ENGELSMA: At 5 p.m. we adjourned to The Normandy. Q: How much of your career would you say you’ve spent in this building? DAN ENGELSMA: Approximately 22 years. CARSTENS: 50%– I had already worked for 25 years before I came to KA. GERHARDT: I only worked in this office for the first couple months of my employment here before being shipped off to Texas for 3 ½ years. Thereafter for the next ten to twelve years I was on jobsites, so my early days were limited in the office. I came back into the office full time starting in 1990ish and never left. Q: What will you remember fondly about your time here? JARVIS: The opportunity to work with great people. GERHARDT: It was mostly about the people…Everybody had each other’s back…we would always try to win as a team… one for all and all for one. HEBERT: I’ve made friendships (and the KA cookie exchange) that have lasted 40 years, with Jan Goebel, Mary Jo Kelly, Chris Dokken and others who are no longer at KA. KELLY: My fondest memories are of all the incredible, amazing, interesting, fun, smart, creative people that have come and gone through the years (well, some are still here!). I was fortunate to have made some lifelong friends in my early days here at KA and we still hang out together. And of course I will never forget all of the fun parties. I will surely always remember Lloyd Engelsma and delivering the cash sheet to his office every morning. Q: What do you look forward to when we return to this block and to a new building? GERHARDT: Creating that same “power of one” culture with an even bigger team and taking it to the next level. My goal is to leave the company in an even better place than what it was, before I came. DAN ENGELSMA: Looking forward to being downtown again with all of us together! CARSTENS: Everything to be NEW-NEW-NEW, fresh and green and everyone in the same building, just like old times. LONDON: There is a lot to look forward to in the new building. Lots of new, greatly talented people are joining the company. There is a new dynamic as technology rules. It will be great to have access to Realty and Circle Pines joining us. I’m sure physically this new building will exceed the amenities that we now have. KELLY: I love downtown so will be very happy to return “home.” I’m also really looking forward to the vibe that is finally hitting this part of town. There should be new adventures for lunchtime eats and lunchtime walks and maybe happy hours like the old days! I’ve seen Sanborn City maps from the 1920’s and 30’s showing houses, rooming houses, auto garages and a grocery/deli (speaking from memory) on the block. The local library or history centers could provide more information.